There are various variations to this recipe and I do have a couple, but I like this one because it is easy and straight to the point. Put a knob of butter into a cooking pot to melt; then pour in the oil and the other half of the onion(slice first). Sauté the onion until translucent; then add the curry, thyme, cloves, black pepper, white pepper and bay leaf. 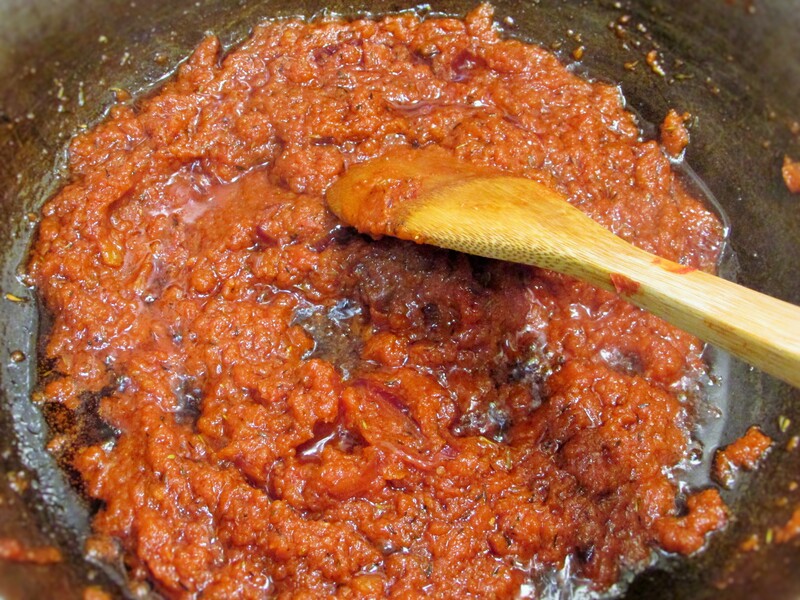 Stir fry for a few minutes; then add the tomato paste and fry until the paste looks a little dry. Add in the blended tomatoes along with the garlic, season with some bouillon(if using)and thoroughly fry until the mixture looks dark and the oil floats to the top (Drain off any excess oil). Remove the pot from the heat and stir in the raw rice; making sure the tomato mixture coats each grain. Pour in the meat stock, check for seasonings and return the pot to the heat. Bring the pot to a boil, cover with a foil wrapper to trap the steam; then reduce the heat. 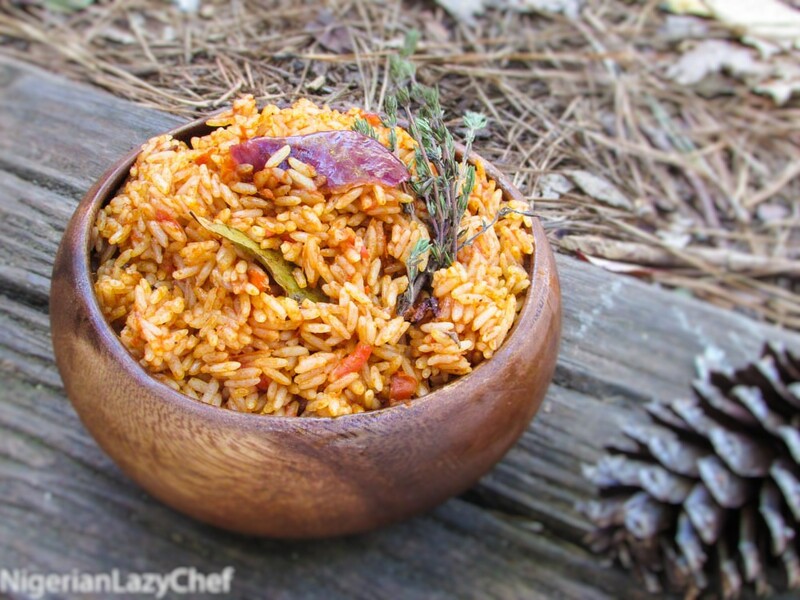 Cook the rice for about 10-15 minutes or until aldente; do not stir. If the rice is not soft enough after 15minutes, just put the foil wrapper and pot cover back on the pot and let it steam in it's own heat for another 10minutes(you may turn off the heat at this point or set your stove on the lowest heat). When the rice soft enough for your liking, grate in some nut meg and ginger and slice in the garnishes; then stir. Let the rice rest once more; then serve. 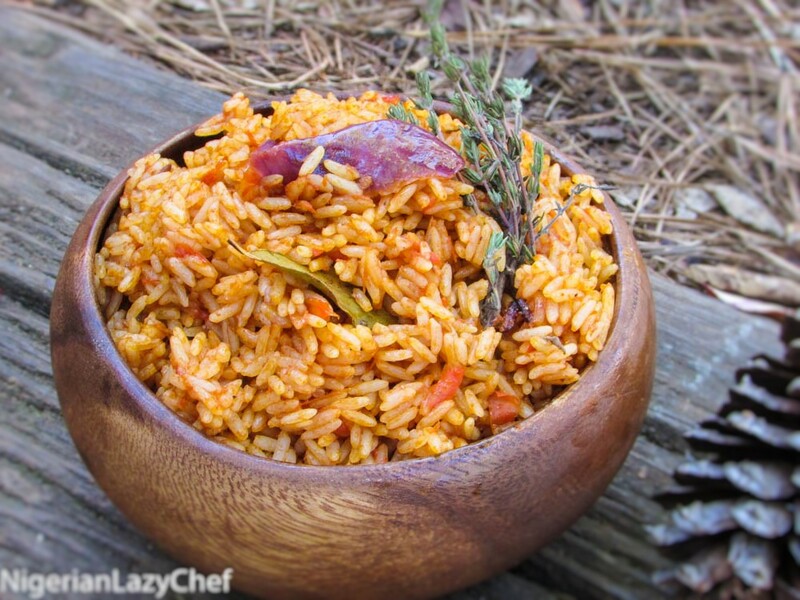 This entry was posted in jollof, Jollof rice and tagged African Jollof rice recipe, jollof rice, jollof rice and peppered turkey, Jollof rice recipe, jolly rice, main dishes, Nigerian jollof rice, Nigerian jollof rice recipe, Nigerian rice recipe, Rice recipe. U r not a lazy chef for nothing indeed!! u just gave me a huge tip – blending tomatoes without water. Cant believe I am actually going through all your posts – maybe cos there isn’t a lot so far? Having fun so far…. Enlightening though…. Thanks for the ideas, u are really good. You are not lazy chef joor. Lol. My sister! Thank you thank you thank you!!! I just made this rice and it’s an absolute hit. 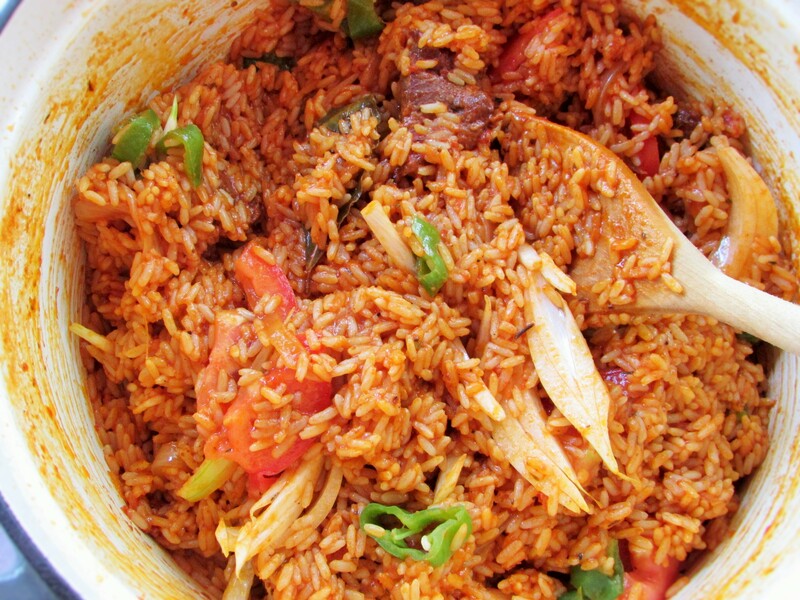 Jollof was so challenging to me and it came out perfect!! I followed this recipe to a T and I will now only use this one lol!! Please tell me how to modify the ingredients for 4-5 cups of rice instead of 3?! This pot will finish today lol.